King Solomon’s often-quoted advice on financial management is solidly based on the idea of prudence and wisdom – two similar but not identical concepts that have to do with heading off trouble at the pass. 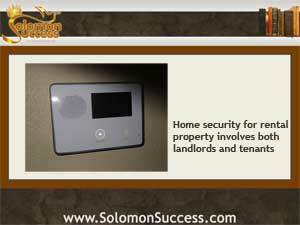 For owners of income property, the issue of home security on residential property is one that can benefit from a hefty dose of both prudence and wisdom in order to stay legal, address tenant concerns and avoid lawsuits. If a tenant installs an alarm system that requires a code, the landlord has a right to ask for the code in order to exercise the right of legal access to the property, which includes emergencies, scheduled repairs and showing to prospective tenants.